Qualcomm is working on a new powerful processor to give Windows 10 on ARM project a much-needed boost. Qualcomm is planning to unveil the powerful Snapdragon 8180 at its annual convention in Hawaii this December. Qualcomm Snapdragon 8180 or SDM1000 is the rumored name of the company’s next processor for Always Connected PCs and if the reports are believed to be true, it’s expected to use an octa-core CPU with LPDDR4X RAM support. It’s likely that Snapdragon 8180 will power the high-end devices in 2019 and it could be the first powerful SoC from Qualcomm for traditional laptops. It is an eight-core chip that is expected to feature a 15-watt TDP. According to the reports, the Snapdragon 8180 or SDM1000 will provide a clock speed of up to 3.0GHz. The four Kryo Gold cores could reach 3.0GHz and there will be four Kryo Silver cores as well with the clock of up to 1.8GHz. It seems that the cores are internally designated as Gold and Silver to differentiate between them. It will have the Qualcomm Adreno 680 GPU but nothing is known about the integrated graphics unit. The 8.5 billion transistors used in the chip will provide an impressive amount of firepower and this would dramatically improve the Windows 10 on ARM initiative. It also appears that Snapdragon 8180 will support the faster LPDDR4X RAM standard with a 2133MHz clock speed. This is a significant upgrade from the frequency of around 1866MHz in Snapdragon 850 or 845. The power would boost the performance of the devices with Qualcomm’s Snapdragon processor. 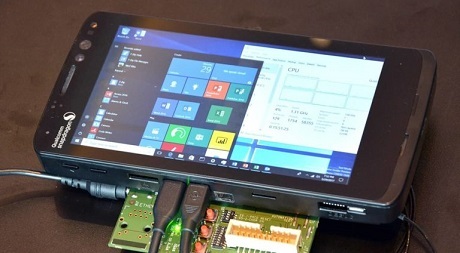 Qualcomm could announce the next-gen Snapdragon processor for Always Connected Windows PCs later this year, possibly during the chipmaker’s third-annual Snapdragon Technology Summit in Hawaii. This is a speculation but it certainly makes sense given the company introduced its Windows on Snapdragon initiative with Microsoft during 2016’s summit in December. At this stage, the development of Snapdragon 8180 or 1000 is nothing more than a rumor but we all know that Qualcomm is working on a powerful chip for Windows 10 devices. For the uninitiated, the Always-Connected PCs offer Wi-Fi to LTE no matter where you are and a battery life of more than 20 hours.